Whether you’re on the blue team, the red team, or no team, you still have to eat. Over the course of our nation’s history, Inauguration Day has been one of celebration and good food, so regardless of who’s in the White House, we see no reason for that to change. Let’s take a quick look at the history of inauguration meals. A far cry from today’s celebrations, the first president of the United States actually dined alone on his inaugural night. After taking the oath of office in New York City, he sat down to eat while awaiting the arrival of Martha Washington, who was on her way north from the Washington home at Mount Vernon. Following Washington, Adams, and Jefferson, who either dined alone or with very small groups on their inauguration nights, Madison decided to do things a little differently. He threw a midnight party with ice cream that set the nation’s inaugural traditions on another trajectory. Like Madison, Lincoln had a midnight buffet and party. After attendees spent the night dancing, dinner was served. Guests carelessly rushed the buffet lines, ravishing the spread and many of the exhibits nearby. Many consider this event to be the nation’s first food fight. Ike is known for having the first ever inaugural luncheon hosted by Congress, a tradition that continues to this day. Inside the Old Senate Chamber, his inaugural party dined on creamed chicken, baked ham, and potato puffs. What else would someone from New England eat than lobster? JFK’s inaugural meal also included tomato soup, crabmeat and prime Texas beef ribs, likely in honor of his running mate, Lyndon Johnson, who was from Texas. Lobster must be a presidential favorite because George W. Bush dined on the famous crustacean, too. It was paired with roasted Missouri quail with chestnuts and brined root vegetables, as well as steamed lemon pudding. Obama decided to turn back the clock for his first inaugural meal and pay homage to Abraham Lincoln. His menu consisted of things that were supposedly favorites of President Lincoln, and they were even served on inaugural china that was a replica of what Lincoln used while he was president. Looking to create an inaugural meal of your own? Whether you plan to watch the inaugural ceremonies or not, we can all agree on a killer menu. 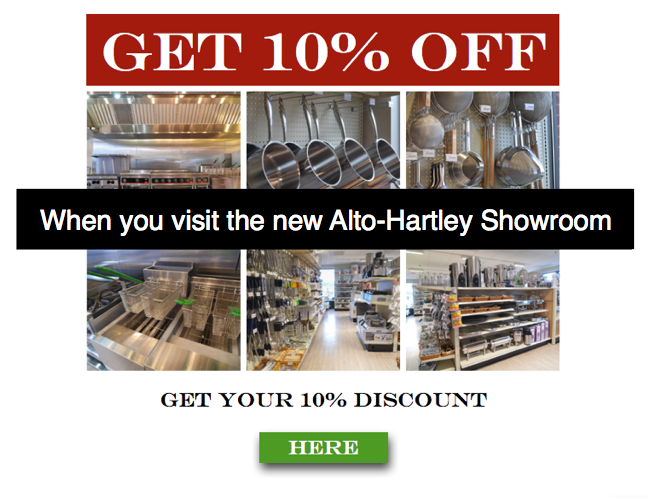 Stop by the Alto-Hartley showroom and discover a full range of equipment that can bring your culinary vision to life. And don’t forget to bring this offer to receive a discount.